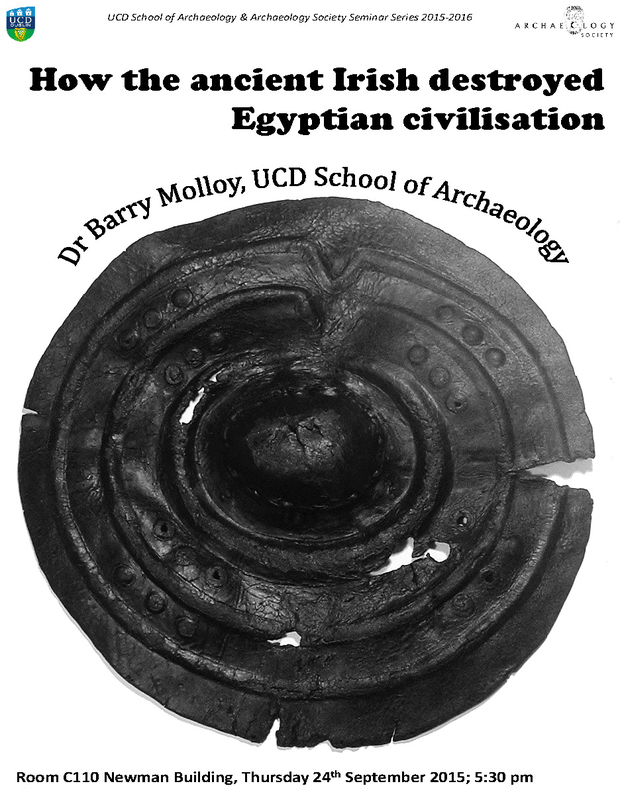 "How the Ancient Irish Destroyed Egyptian Civilisation"
The truth is, the ancient Irish did not destroy Egyptian civilisation. This seminar focused on how extensive the transcultural phenomena were that extended across Europe, and investigated how such phenomena may have originated and spread across Europe. It explored issues such as religious symbolism, focusing mainly from the period 1200-1000 BC. In the early twentieth century, archaeologists such as Childe used directional diffusionism in archaeological explanation. Ex oriente lux and binary oppositions such as civilisation and barbarianism were used to explain archaeological cultures. Today archaeologists have very different opinions on what Bronze Age life in Europe and the Mediterranean was like. Harding believes it was a period of local traditions with selective interconnections, while Kristiansen sees it as the ‘EU without the Red Tape’. There is certainly evidence of cross-cultural links in this period, such as in the area of religious symbolism. One example of this is the sun wheel, which is a prominent feature of European prehistory. This symbol has been found in areas such as Ireland, Turkey, Sweden, Egypt, and many others. Sun symbolism was an integral feature of the period, with examples ranging from Early to Middle Bronze Age gold sun discs to sun symbolism evident on the base of Early Bronze Age pots in Atlantic Europe. It has also been found in the chariot wheels of the Indo-Europeans in the late third or early second millennium BC. Perhaps the most famous chariot which bears this symbol is the Trondheim chariot. This symbolism is evident in many other forms as well, including rock art, jewellery, shields, bridles, leg armour and helmets. Shields in the Bronze Age world are another medium through which transcultural phenomena are evident. Examples from Iberia and North Western Europe were of similar v-notch forms, both from early dates. Those from Delphi in Greece and Clonbrin in Ireland are also of a v-notch form, as are examples from Denmark and the Czech Republic. There is evidence to support the development of such shields in Atlantic Europe, and their subsequent spread to central Europe. Spearheads are another medium through which transcultural phenomena can be seen. Spearheads of a typology similar to Bronze Age European examples were found in Mycenaean Europe. These were copies of Bronze Age spears and were not functional, but show the importance of the symbolism of the Bronze Age, as it was still evident four hundred years later. This symbolism played an active role in identity religion. Apollo was a key figure in Bronze Age religion, and is seen as a voyager between archaeological worlds. He is the only Olympian deity not mentioned in Linear B, and is sometimes confused with Helios. He is the only god whose worship place (Delphi) closed for a month each year. Apollo was introduced from beyond the Mycenaean world after its collapse. Common attributes and derivations of deities are widely shared in Bronze Age religion, as is evident from Apollo. Bronze Age society collapsed in the Eastern Mediterranean circa 1200 BC. This was due to the invasion of the Sea Peoples. Representations of the boats of these peoples at Medinet Habu seem to indicate boats of Aegean or Danubian style. They may have been a European type, or a derivative thereof. Representations of boats found in Greece, Central Europe and Sweden show similar boats. This indicates a spread of people and ideas.